While I’m not an expert (by a long shot) in bead embroidery, it’s something that I enjoy exploring. I love to dabble with beads and add them to my stitching when they make sense. “Beads for the sake of beads” doesn’t always do it for me – they really have to fit in with the project I’m working on. So I don’t add them to everything I stitch, and in fact, I stitch without beads more often than I do with them. But on certain types of projects (Party in Provence, for example), beads make perfect sense. They’re fun, they sparkle, and they work with the design. 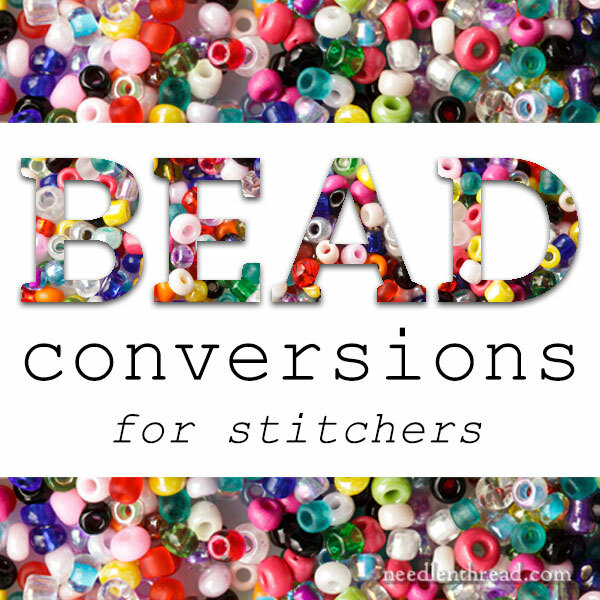 If you’re interested in adding beads to your own needlework projects, you might find these bead conversion charts that I’ve come across online helpful. You’ll find conversions for beads to beads (one brand of bead to another) and conversions for floss to beads (choosing beads to match embroidery floss colors). If you have any favorite online sources for bead conversion charts, feel free to mention them in the comments below and I’ll add them to the list! What’s Up at Needle ‘n Thread? Well, I ventured forth for the eclipse, as I mentioned on Monday. Between the cloudy skies and bouts of rain, amazingly, we did get about a five second break in the clouds during totality, so that was neat! Was it worth the ungodly early hour, the drive, the traffic, the rain, and standing in line to use a… a…. Porta Potty!? Well, I had a good time with my family and there was that 5 second glimpse of something I may never see again … but if I knew the circumstances ahead of time, I probably would’ve skipped it! As luck would have it, I’ve been sick ever since I got home Monday night. When I feel better, my outlook on the whole excursion might improve! In the meantime, I’m still picking threads on this project, and, if all goes well today, I’ll be setting up a new project that I’ll show to you soon. I’m also working on something for those who’ve been asking for Party in Provence. Coming up, we’ll chat about a new lot of threads, I will finally get to the point on my workroom organization and the things I find essential in the space (which is still not straight! ), I’ve got a little stack of books I’ve been working through to review so I’ll be filtering those out to you, and lots of other little bits that are slowly coming together! Hope your week is going just swell! Mine is definitely improving as of this morning! Sunny skies ahead! Sorry to hear you didn’t enjoy the eclipse experience as much as you thought you would and I do hope you feel a lot better soon. The bead conversion charts are very useful and will help me when I want to use beads in my projects. I’m looking forward to pictures of your new organised workroom and for the future book reviews. Thanks for sharing the bead conversion tables I didn’t know they existed and for letting us know your future reviews. Thanks, Anita! I’m feeling a bit better today, so I’m hoping to get back into the swing of things! Glad you are feeling better and really hope you will be back in the swing of things very soon. Glad you got a glimpse of the eclipse. Thanks, these do look useful! I tend to just noodle around until I find something that matches, but having actual data already provided will give me more time to embroider. Hi Mary, I didn’t receive today’s message in my email. Had no idea there were conversion charts for beads. Thank you so much for sharing! Reading you articles puts a smile on my face & is a great stress reliever. Hi Mary, I love your posts! Great ideas and resources, and good grammar to boot! One thing I’d like to ask, do you use nylon thread when attaching beads to your work? I always have because I learned early on that the edges of glass beads can fray cotton embroidery threads. What do you think? Well, most of my embroidery projects are primarily embroidery more than beads, so I use floss. I pretty much use beads that are “finished” and smooth – like Delicas or Mill Hill. I think bugle beads tend to be a bit sharper on the edges, but I don’t use them too often. Floss as worked fine for me so far! I hope you don’t mind me popping in. I’m beader who likes a bit of stitching instead of a stitcher who likes a bit of beading, so I know more about it from that front. Bugle beads, beads that are “cut,” and crystals can fray fibers, but if the work isn’t going to be moving much (like a bracelet moving around your arm or swaying earrings or necklace) that cuts the risk down quite a bit. Also using more than one strand of floss. Do they make bead reamers small enough for bugle beads? One thing I’ve seen done is to use a small rounded bead at each end of the bugle bead, although that might not give the look you want. OTOH, it could be cool to use different color beads mixed together. Could you show or direct us to an example of beading for beading’s sake that doesn’t particularly work or fit with a design. Hi, Beth – Oh, I think this is just a matter of personal preference. I’m speaking in regards to my own designs. I don’t feel like I have to put beads on designs, for example, just because they add sparkle or because I like beads. I really only use them when I think the design really calls for them and will be better because of them. Sometimes, I might try beads on a design and find that they don’t really add anything to it, or, worse, they take away from it. Again, just a matter of personal preference…. I can’t find TOHO bead 22C on any of the lists. I’m sorry the eclipse didn’t turn out so well for you but glad you got to see a few seconds of it. There’s another in 2024 that will be closer to you than to me, but the weather doesn’t look so great for that, since it’s in April. It’ll give you time to work up your Eclipse Sale strategy, though…. I use a fair number of products from Susan Johnson ( SJ-designs). She has lovely glass pearls, agate & quartz as beads, hearts and stars, lovely beads in great colors and a collection called “cocktail” that are color coordinated beads of. various sizes and shapes that are great for embellishments. Think mimosas , White Russian, grasshopper—-. She also carries canvas, leather, vintage ribbons and books and her own line of ribbons and designs. New website was easy to use, even if not quite complete. Go have a look and enjoy. And she is a doll to work with. I’m glad you’re feeling better. My eclipse experience was a total flop – rain & clouds during the whole thing, didn’t get darker one bit. I console myself with the fact that at least I didn’t drive for hours to not see it. Hi Mary, I use a lot of Susan Johnson’s beads (SJ-Designs). She has a line of seed beads, but also some wonderful 2,3,&4 mm glass pearls in lovely colors, assortments of coordinating “Cocktail” beads— think Mimosa, Grasshopper, White Russian—-, agate and quarts beads, stars and hearts. She also has flat sequins, leathers, ribbons and a vintage and antique line of tools and books. And of course she has her own line of designs. New website is up and easy to use, has PayPal, and she is lovely to work with. Take a look at her line, you’ll be glad you did. Previous Previous post: I’ve Been Eclipsed – to Your Advantage!